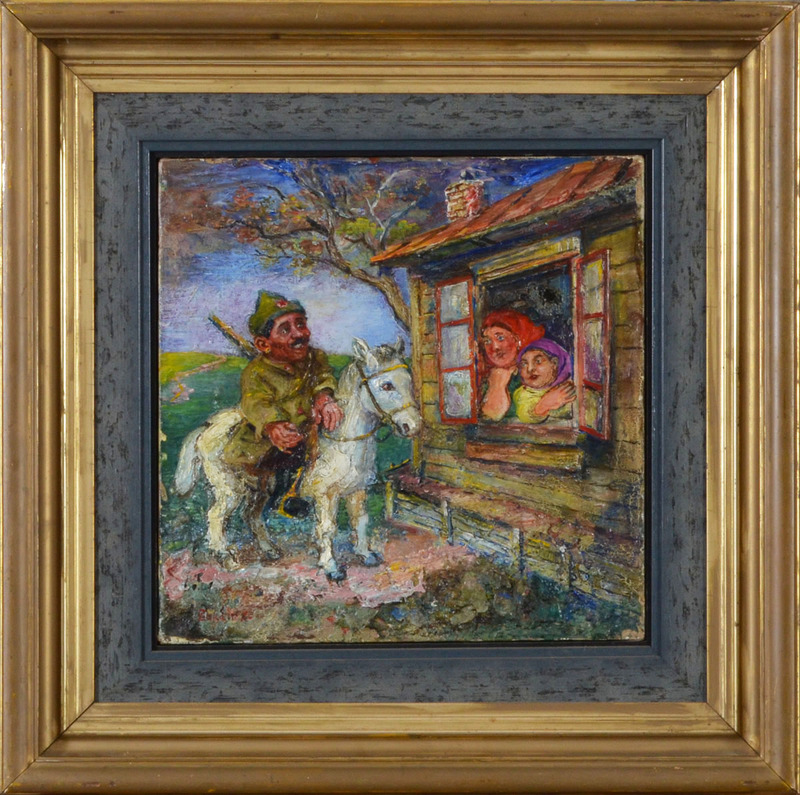 A wonderful painting by the "father of Russian Futurism", David Burliuk. Oil on canvas board, 13 x 13 inches, framed, signed on the lower left. Painted with heavy impasto brushwork. Burliuk studied at the Royal Academy in Munich and at the École des Beaux-Arts in Paris. In his most active period he participated in many important avant-garde exhibitions in Kyiv, Moscow, St. Petersburg, and Munich. The appearance of the Futurists, as they called themselves, liked to wear gaudy waistcoats, sometimes painted animals on their faces, and wore wooden spoons in their lapels. Their performances drew packed audiences, scandalized many, but also won many new converts to this new vision of art. Burliuk’s exuberance for life, his creative force, and his celebration of the new left a lasting impact on the history of modernism. His later work reflected the life in rural Russia. This image is an expression of his memories of childhood in Russia at the turn of the century.